Here is a compiled list of the popular cannabis strains to grow at home. Each strain has a picture as well as some quick bullet points about the strain. We highly suggest you identify the type of strain you want by reading about the differences between Indica vs Sativa cannabis. We also have a highly detailed Marijuana Growing Index that covers growing your plants from A – Z.
B52 Cannabis is a truly superior Skunk strain. These marijuana seeds are ideal for the commercial grower, growing some of the very best buds found anywhere. As with certain other Skunk varieties B52 has a very superior sweet taste which is the Sativa influence. B52 is a superfast Skunk strain flowering with giant buds thanks to its big bud mother. B52 produces a cerebral stone effect enjoyed by many connoisseurs of Skunk. 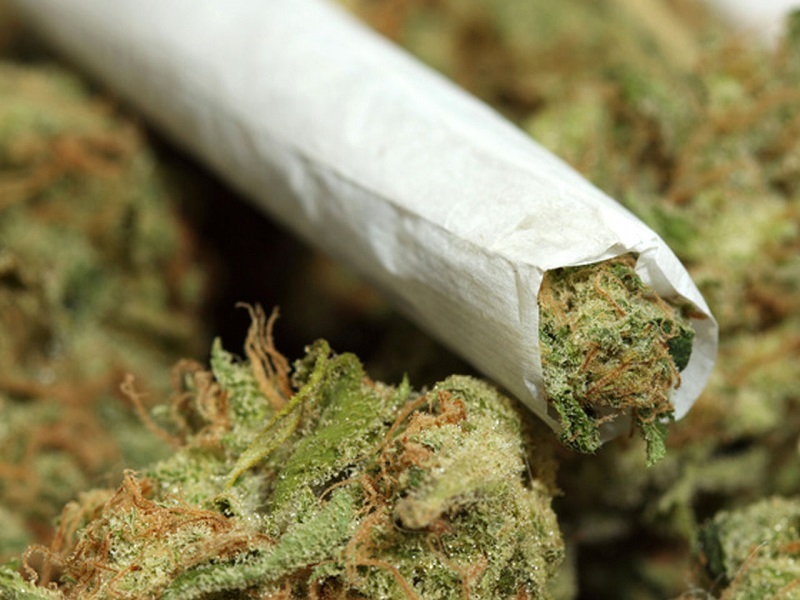 Four Way marijuana is a cross of four strains ¼ Indica, ¼ Ruderalis, ¼ Northern Lights and ¼ Skunk 1. Fourway usually takes on an Indica sort of an appearance, bushy with medium large leaves. This mix of seeds produces a relatively mild sweet smoke and has great all-around taste. Four Way works well with most growing systems is highly resistant to most diseases, easy to clone and a good producer. The origins of Kush cannabis are Northern India and Pakistan named after the Kush valleys running along the Hindu Kush mountain range. The marijuana seeds were brought back in the 80’s, cross bred then selected for aroma balanced and growth characteristics to create a lovely plant. This plant has sweet spunky aroma with big dark green leaves and can be enjoyed often throughout the day. Good choice for those wanting to try an Indica. 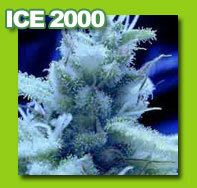 Ice marijuana seeds is one of the new generation high THC varieties. As the saying goes, “It’s cool as ice”. Flowers are richly covered in crystal with dense consistency usually along a main stem with a high flower to leaf ratio. Good for hydro applications as well as potting or outdoor/greenhouse cultivation. Ice cannabis has ancestors of Afghani and Northern Lights families and it smokes smooth as Northern Light with a sweeter taste and aroma. Ice is a winner of the Cannabis Cup. A relatively compact plant with compact buds, related to White Widow. Flowers are white with THC and produce a large yield. K2 marijuana seed is a white strain Indica Sativa with a smashing soft fruity sweet taste with a touch of spice and it has wonderful aroma. Great choice for indoor growing weed in limited space employing hydro or other indoor systems. K2 produces a spacey high which comes on quick. Shiva marijuana seeds yields a pungent Afghan aroma. Shiva is a bushy plant with good yield and quality. Good selection for indoor cultivation. This strain is named after Shiva, Hindu god of transformation. This strain has some heritage from India and likes indoor cultivation thus a good choice for the less experienced grower. Shiva cannabis has a pungent aroma and pleasant up high. Skunk Red Hair cannabis made indoor growing practical since the mid 80s. Still a grower’s favorite for indoor cultivation, it’s even tastier when cultivated outdoors. Red Hair marijuana is a strong plant which develop a distinctive blush when the flowers mature, which is an indication she’s ready for you. White Widow cannabis is one of a kind and winner of the Cannabis Cup in 1995! This plant is the strongest among the weed species. Has the highest percentage of THC !!! Also known as Snow White, A relatively short plant with high flower to leaf ratio it can do well indoor and outdoor. White Widow marijuana has a delicious aroma and sweet smooth fresh taste, as well as a serious high. Watch the flower maturing stage and harvest at the peak of white crystal formation which will cover the flowers. Avoid excessively cool damp conditions in the maturing phase. Aurora Indica cannabis is an Afghan mixed with Northern Lights. 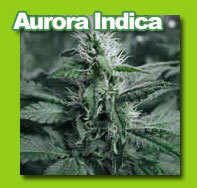 Aurora provides a Mango/citric like aroma and heavy Indica buss. Aurora is a short plant but produces heavy large colas more than making up for its shorter statue. The scent is usually lemony and the plant matures with crystallized flowers along a main stem. If you haven’t tried Aurora it’s high time you did. Bubble Gum cannabis is a treat with its sweet fruity aroma and taste. 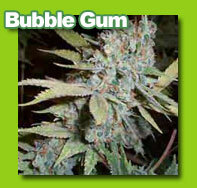 Bubble Gum pot was developed in the U.S.A., brought to Holland in the 90’s and further refined. Bubble Gum marijuana is quick to produce vegetation, flowers in about 8 weeks and has highly resinous flowers. Bubble Gum seeds have a sweet aroma and just as sweet taste. Imagine savoring this selection as you ride a really uplifting high. Bubble Gum is a former Cannabis Cup winner 94, 95 and 99. Chrystal marijuana seed is a White Widow re-crossed with Northern Lights. Chrystal’s buds are big seeds and sticky with an almost kerosene like aroma and produce a quick hitting high. Chrystal cannabis is a first-place winner of Highlife, 2002. A tasty and spacey selection we know you like. 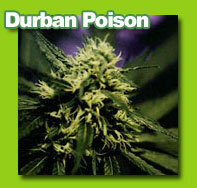 Durban Poison marijuana seed is a South African Sativa seed crossed with a potent Skunk developed in Holland to enhance the quality and subsequently stabilized. Both inside and outside cultivation may be employed with good results, but it’s easier to manage outdoor. Buds are typically long and fat, the taste and aroma are sweet somewhat similar to Thai with a hint on anise flavor. Experience this legend. Holland’s Hope marijuana seed is an Indica/Sativa mix of Afghan with Skunk cannabis. Holland’s Hope is an ideal plant for the outdoor grower cultivating in cool climates and where short summers may limit the growing season. This is strong plant, mold resistant variety, can grow to nearly 4 meters in height with high yield. This is one of the first strains grown in Holland; it’s recommended by many and has a knock out high. 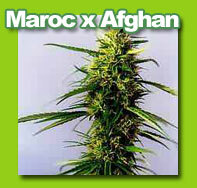 Maroc x Afghan cannabis seeds. The Afghani for this selection was chosen after a long process of stabilization of 10,000 plantings. The project took nearly 8 years of development. The results were a great harem of Afghani virgins that were pollinated with by a select Moroccan brought back form the hash making Ketama region of Morocco. This plant is a 2-time winner of cannabis cup. 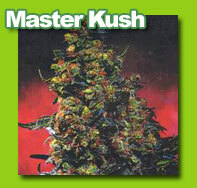 Master Kush marijuana is a strong plant for almost all climates. Only the real cool countries out will have a second guess. This plant has maintained a high quality and a good quantity with a great taste. Flower within 8 weeks makes an excellent choice. This plant is a tetraploid kind, which means that it shows sometimes female flowers in the splitting of the internodes which is unique. Misty cannabis is a delightfully flavored variety, some say it tastes like candy. Misty marijuana seeds has a bushy appearance is very resinous and with a family relationship of White Widow and Snow White, what you would expect? 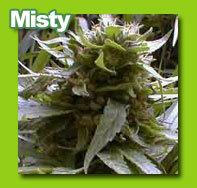 Misty yields a powerful relatively light smoke, great for sharing, extraordinary taste and it’s easy to grow. With ancestors of Holland’s Hope cannabis and famous Skunk#1 you’ll know it’s great. Try this handsome powerful marijuana plant with purple to dark purple blooms in the later stages of flowering. New Purple Power hemp is easy to grow, provides a sweet taste and powerful clear high for daily enjoyment. 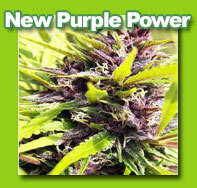 New Purple Power is a new adaptation to the Dutch climate with colorful flowers, yielding an active buzz. 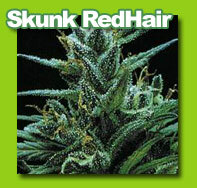 Skunk Special cannabis was developed for skunk lovers. Brush against this plant and the room fills with aromatic skunk. 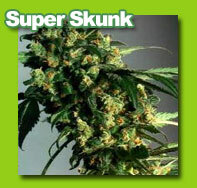 Skunk Special marijuana has distinctive skunk qualities along with enhanced power and plant vigor. This plant is especially developed for Skunk lovers. Skunks cannabis and their Afghani ancestors have been crossed for this one. Brush against this plant and the room becomes immediately filled with a powerful Skunk aroma. Despite the smell a very pleasant high with a little more body to it than the Skunk #1. One of the winners of the 1990 High Times Harvest Festival where it clearly defeated Skunk #1. Yield in greenhouse: up to 500 gr. Supergirl is one of the new powerful strong kinds! This plant is dark green, sturdy and easy to grow. Supergirl cannabis seed produces big swollen buds with shining THC crystals. After your labor of love growing Supergirl you’ll be rewarded with of her high THC content for hours in Nirvana. This is our second commercial plant somewhat similar to Big Bud cannabis but with a much sweeter taste. Top 44 marijuana seed is a very fast flowering variety which under ideal conditions can be ready in ~6 weeks. Top 44 is a strong easy to grow plant and a great selection for the first timer. Top 44 performs indoor and outdoor service. This feminized plant starts slowly but after that it grows with great speed creating a big bud. Nice big green leaves and a specific odor. New generation Ganja. Good profit with a strong high! Indoor and outdoor. Flowering time: 60 days. Jock Horror marijuana seeds, better known as Jack, is a multiple hybrid of Northern Lights, Skunk and Haze seeds which delivers a strong up buzz. This variety produces so much resin even the branches glisten with resin glands. When raised right its wacky weed, sweet, tasty and stony cannabis. Jock is a delight to the palate and the mind. Our hats are off to Jock. Ice marijuana seeds is one of our new generation high THC varieties. As the saying goes, “It’s cool as ice”. Flowers are richly covered in crystal with dense consistency usually along a main stem with a high flower to leaf ratio. Good for hydro applications as well as potting or outdoor/greenhouse cultivation. Ice cannabis has ancestors of Afghani and Northern Lights families and it smokes smooth as Northern Light with a sweeter taste and aroma. Ice is a winner of the Cannabis Cup. Use the comments to let me know what your favorite strain is.